If It's Too Loud...: Lucy Dacus - "Night Shift"
Lucy Dacus' 2016 album, No Burden, was really good (although we somehow missed it, oops). Her latest single off her follow up might be the best song of 2018. "Night Shift" is amazing. It starts off as quiet, fragile singer/songwriter fare. For the first two minutes, it's a delicate and powerful song held together by Dacus' voice and a barely strummed guitar. If that was how the song played all the way through, it would be beloved here. But then some drums and other instruments come in, filling out the song into a more mainstream singer/songwriter track. Dacus' voice gains some strength for this part, and once again, she masters this slightly different genre of song. Then it quietly but abruptly goes minimal again, with just voice and guitar. This is just brief until a fuzzed out stomper of a song crashes in, taking over. Dacus fuses together 3 distinct songs into one masterful track. It's simply a must listen. You can listen to "Night Shift" below. 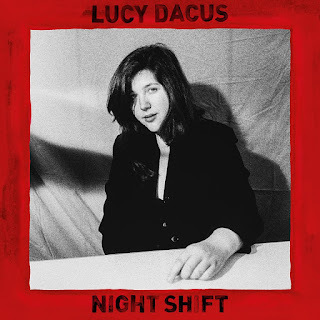 The new album from Lucy Dacus, Historian, will be out March 2 on Matador Records. You can pre-order a copy here. For more on Lucy Dacus, check out her website.